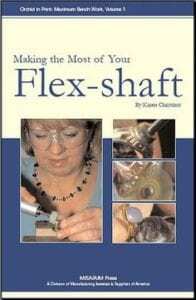 A welcome addition to the literature now coming out for bench jewelers, Making the Most of Your Flex-shaft by Karen Christians is an informative compilation of material for anyone who takes tools seriously. Everyone with a flex-shaft understands what a valuable tool this is. Volume One in the “Orchid in Print: Maximum Bench Work” Series. A Collaboration between Manufacturing Jewelers & Suppliers of America and The Ganoksin Project. Here is a chance to learn more about it in order to maximize its effectiveness, efficiency and longevity, whether you are a beginner or advanced flex-shaft user. The author presents a history of the tool, beginning nearly 200 years ago, along with essential information on the use and maintenance of a flex-shaft. The book covers all the standard uses and goes into depth on accessories and optional attachments including hand pieces, milling tables, sanding belts, setting tools, lathes and more, all driven by a flex-shaft. The book catalogs a vast range of burs, bits, buffs, brushes, burnishers, mandrels, discs, cutters, wheels, polishers and ceramic points, that fit into a flex-shaft. In the final chapter, “Beyond the Basics,” you can learn how to use a flex-shaft to tube-set stones and a few other neat things outside the box a flex-shaft comes with. As the most complete book on the subject, Making the Most of Your Flex-shaft belongs right next to yours, on your bench.